Spring is in the air. Flowers are blooming, the sun is making a brighter, longer appearance. Summer will be here soon. Thus, it is time for me to think about the bright side of having thyroid disease. I once heard someone say that thyroid disease is a “hormonal” disease. Hmmmm I wonder if this is why I’m the only one in the family who truly understands my teenage son, because after all, the teenage years are a “hormonal disease“ as well… who is with me on that?! It’s like we speak, the same language or something. Getting along with my teenager is definitely a plus! Another great benefit is that once upon a time I was socially inept, but now, after thyroid disease not only can I relate to teens, I can converse with menopausal and pregnant women. However, I can only interact with a pregnant woman for about 2 hours then things turn ugly. I’ve got wacky and wild hormones gyrating, pumping, and…uh-whatever else hormones do-all throughout my body. This automatically places me with the “in” crowd. Yea! I do kid, but hormonal imbalance of any kind is serious business, it can cause a myriad of issues like thyroid disease, diabetes and some cancers. Many believe that this hormonal imbalance stems from years of ingesting excess hormones found in red meat, dairy products and eggs (to name a few). Not only are hormones eaten, but there are also chemical herbicides and pesticides that are hormone mimicking, and considered to be endocrine disrupters. Various research institutes, universities, environmental protection organizations and concerned citizens believe the slow process of ingesting and inhaling hormones have caused the rise of illnesses over the past decades. I am not sure if this contributed to my hormonal disease, but I do know that I can hang out with my son and his teenage buds anytime I want…hmmm where did he go, he was supposed to wait for me??? Many experts believe that getting too much of a certain hormone can throw other hormones out of balance, perpetuating the hormonal disease we see today. 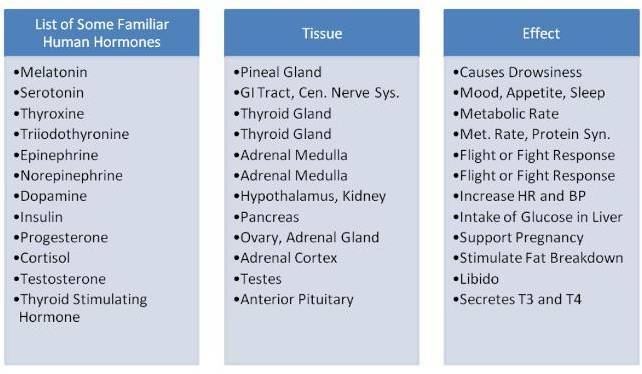 Below is a list of some well-known human hormones (not an exhaustive list) and their role in the body. I’ve also listed what they effect. If you are having serious issues in these areas, it may be a good idea to get your hormone levels checked.